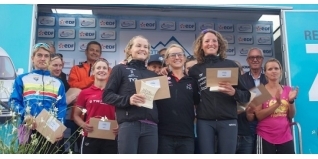 Great Britain's 2009 World Time Trial Champion and 2008 Beijng Olympics Silver medal winner Emma Pooley continued a long line of British success when taking the title at Friday's Alpe d'Huez Long Course Triathlon. It was a significant win too, taking the scalp of the current ITU World Long Distance Champion (and Alpe d'Huez 2012 winner) Mary Beth Ellis (USA) in the process. In typical style, Pooley conceeded significant time in the 2.2km swim, seven and a half minutes in fact to MBE. That deficit was reversed (and more) on the bike, the British athlete recording a 4:08:39 bike split, a touch over 10 minutes clear of the American. Most of that gap was regained on the final climb of Alpe d'Huez, where organisers take a seperate split time. Pooley recorded 55:22 for that section versus the 1:03:47 of Beth Ellis. Given that Pooley was one of the best climbers in the world during her professional cycling career, it's no surprise to see her excel on this course. Pooley is much more than just a cyclist however - as we've highlighted previously - and the current ITU Powerman World Long Distance Duathlon Champion extended her lead with a 1:30:37 run split, almost five minutes faster than Beth Ellis to secure a six minute victory margin. Pooley continues a British heritage at the race which includes wins by Chrissie Wellington in 2007 and 2008, Jodie Swallow in 2010, Cat Morrison in 2011 and 2014 plus Ritchie Nicholls in 2013. There was a home win in the men's event from Arnaud Guilloux, ahead of 2010 winners James Cunnama (RSA) and the fast running US athlete Scott Defillipis. The top British men were Andrew Greenleaf (6:09:48) and Robert Brundish (6:12:11) in 12th and 13th place respectively.